March has been a chaotic month for me. After two food conferences in Birmingham and Louisville, one week of SXSW in Austin, and way too many heavy dinners (chicken and waffle with extra syrup anyone?) I finally came down with a cold. Lessons learned: (1) DON’T ever arrange three conferences back-to-back (2) Eating fried chicken four days in a row can cause problems. When recovering from the groggy cold, this detox herbal vegetable broth plus Vegetable Noodle Soup was my dinner for several days. A few weeks back I introduced the concept of Chinese herbal soup mix and a Herbal Chicken Soup recipe. 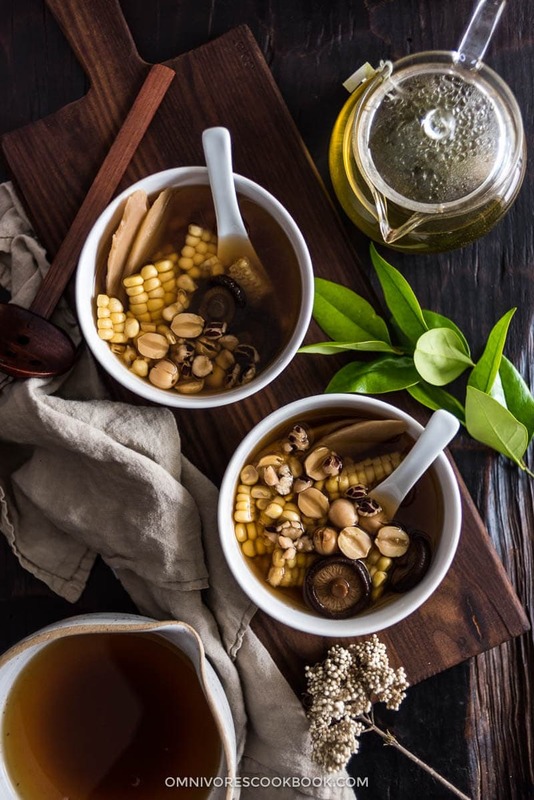 Just as a quick recap, Chinese herbal soup is an essential part of traditional Chinese cuisine. It combines food and herbs that work together to draw out the benefits they otherwise wouldn’t release on their own. By combining them, they target certain health concerns such as insomnia and digestive issues. 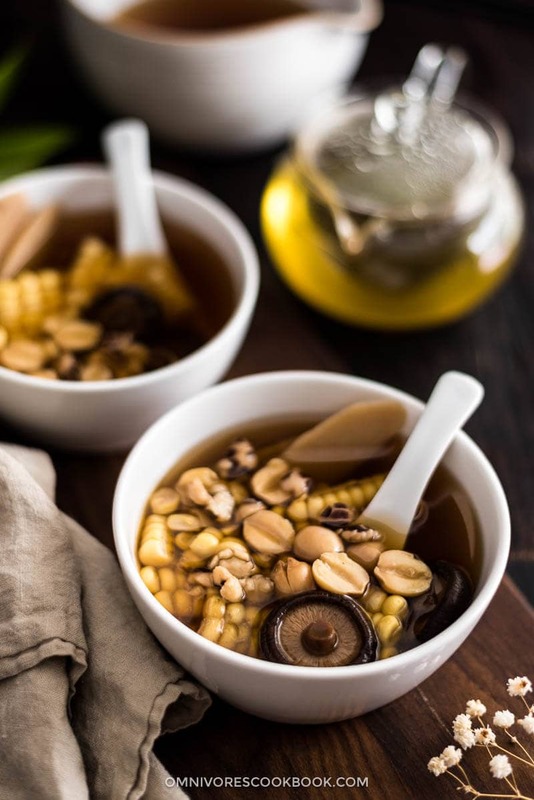 In China, using all-natural and chemical-free food is viewed as a crucial way of healing and nourishing the self (食疗, shi liao), which leads to a healthy life and longevity. 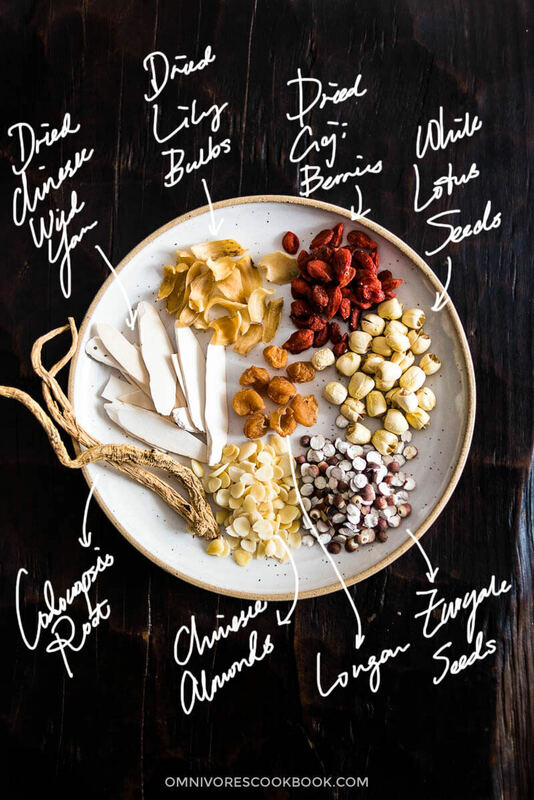 Chinese medicine views food as a natural remedy and organizes different foods according to their energetic effects to our body. Certain foods are viewed as warm and nourishing (yang), while others are seen as cool and detoxifying (yin). 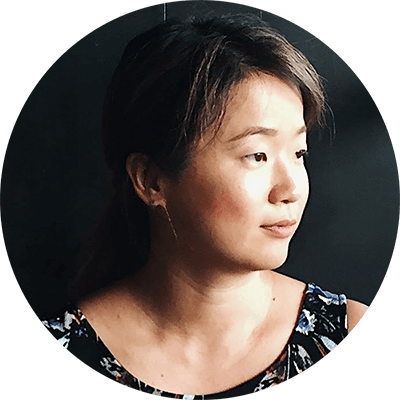 Some build qi, while others have blood, yang or yin-building properties. The detox herbal soup mix is for those that have accumulated too much heat in their system. We call it “yeet hay” in Cantonese or “shang huo” in Mandarin, literally meaning “hot air” and “on fire”. 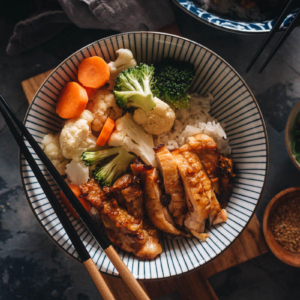 It is a term used in Chinese medicine to indicate a state of being too “hot” and is brought upon by eating lots of fried, greasy, or unhealthy foods. The symptoms can vary depending on how yeet hay you are. If you are only slightly yeet hay, you will probably have a slight sore throat and some pimples. If you are overly hay, mouth sores and nose bleeds are not uncommon. Chinese Almonds (Xing Ren) – These “almonds” are not almonds at all, but actually apricot kernels. This herb directs heat downward and soothes the lungs. It also helps with intestinal dryness and moistens intestines to relax bowels. Codonopsis Root (Dang Shen) – Promotes general good health. 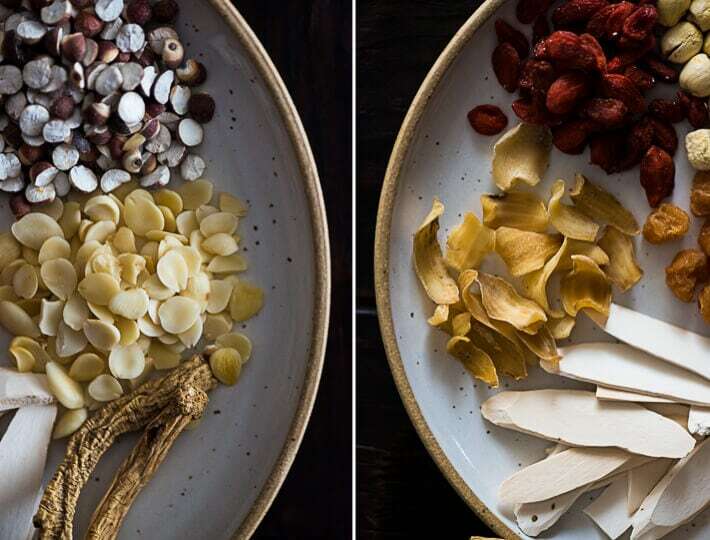 Dried Chinese Wild Yam (Huai Shan) – Enhances energy, aids digestion, promotes muscle growth and repairs worn-out tissue, and help alleviate bodily weakness after a long-term illness. Dried Goji Berries (Gou Ji Zi) – Helps boost the immune system and protect the body from high levels of inflammation since goji berries fight free-radical damage. 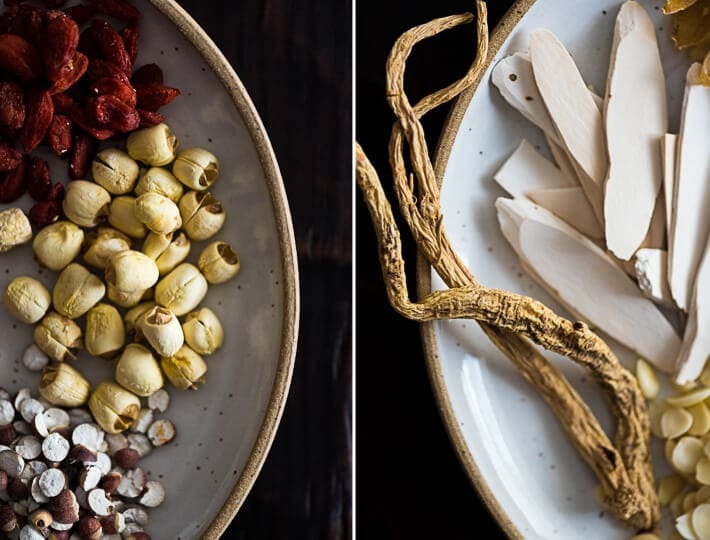 Dried Lily Bulbs (Bai He) – Widely applied to calm spirit, clear heat, and moisten lungs to relieve coughs. It is capable of nourishing yin and is mainly used to counter ascending fire due to yin deficiency. Euryale Seeds (Qian Shi) – Known as the “water ginseng” thanks to its aquatic nature and high medicinal value, euryale seeds lead to an enhancement of vitality, anti-aging, life extension, weight loss, and youthful-looking skin. Longan (Longyan) – Supports restful sleep and replenishes blood and Qi. 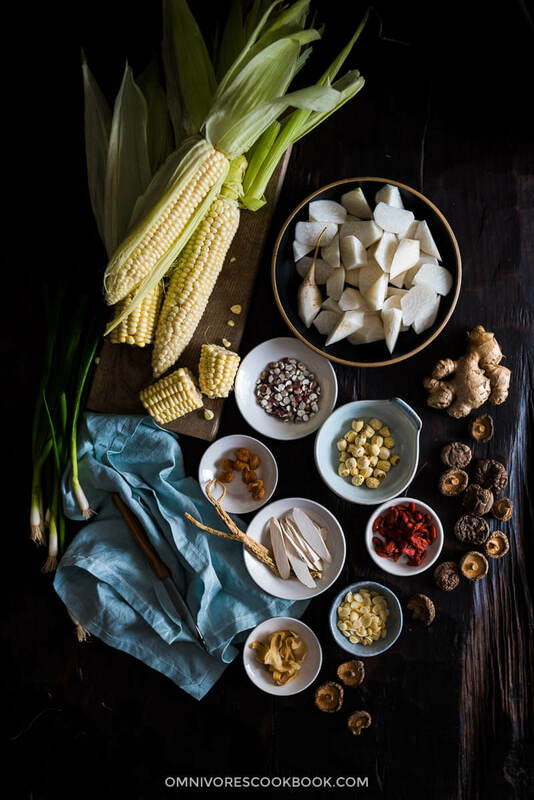 White Lotus Seeds (Lian Zi) – Containing an enzyme with anti-aging properties that helps to repair damaged proteins, lotus seeds are also known for their anti-inflammatory properties. They help regulate the energy levels of the body, restore health, expel heat while being neutral in nature, calm nerves and strengthen the spleen and stomach. The detox mix is meant for clearing heat and toxins, cooling and calming the blood and nourishing yin. 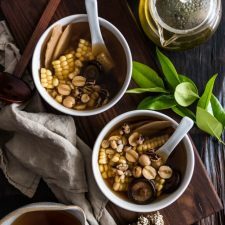 Not only does it help you cleanse your body and balance your system, it adds a nutty and slightly sweet aroma to your broth and makes it hearty and refreshing. 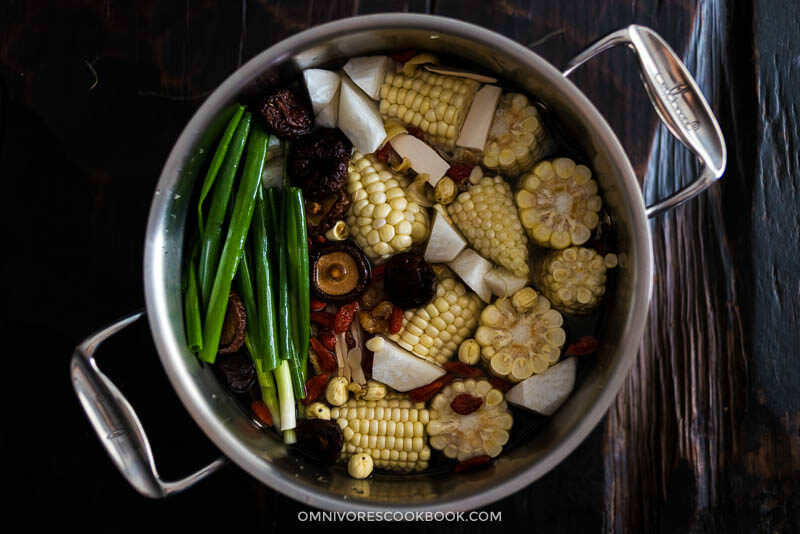 When I was developing the detox broth, I used the detox herbal mix and a few types of vegetables that enhance the yin-tonifying benefits. I also tried to design a balanced flavor that is not overly sweet or grassy. Once you’ve made the broth, it is ready to drink. However, if you want to change things up, you can also add in other vegetables to make it into a noodle soup. Definitely feel free to change up the ingredients and build your own vegetable detox soup by using the ingredients above. The soup mix is pre-portioned and prepped, so you can simply rinse and add chicken and water. That’s it! Each soup mix is designed by an expert herbalist in LA to guarantee the health benefits and good flavor. All the herbs are curated locally and hand crafted in small batches to maximize their freshness, so your soup will be extra fragrant. 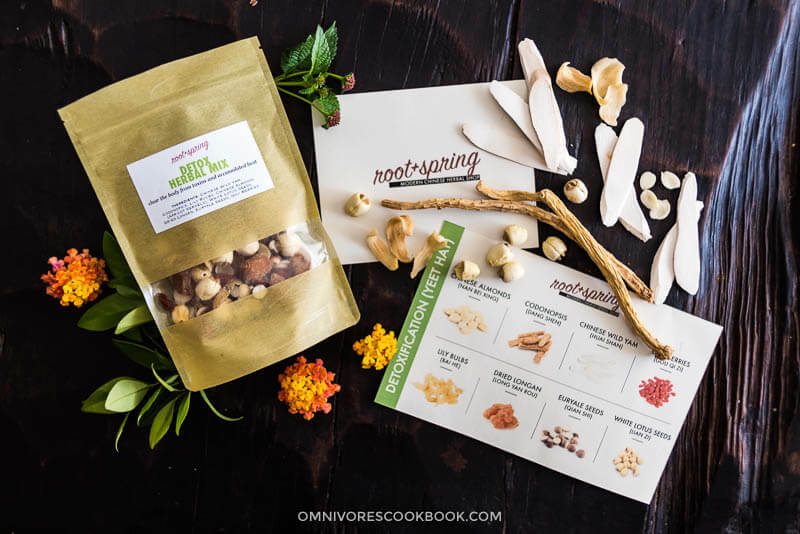 Every order comes with a recipe and information on the healing properties of each herb. No more guesswork while cooking! What I like the most is the freshness of these herbs. When you open a bag, you immediately notice an almost-sweet, fragrant, nutty aroma. All the roots and herbs are very clean, retaining their original color. Compared with the herbs I get from my local Asian market, Root and Spring Soup mix is 10 times fresher. 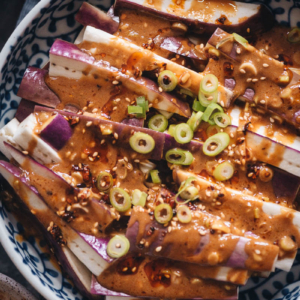 Next time when you want to get the grease out of your system, whether it is after Chinese New Year, Thanksgiving, or pizza night, you know what to make in your kitchen! Disclosure: I’ve received these herbal mixes to test recipes but this is not a sponsored post. I love the quality of the soup mix so much I wanted to introduce it to you as well. The owner of the shop Cindy is an expert in Chinese herbs and medicine, and helped me to better understand healing soups and introduced me to the benefits of Chinese herbs. Thank you Cindy! Rinse the herbal mix with tap water and drain. Combine all the ingredients in a 5-quart pot and add 12 cups water to cover all the ingredients. Cook over medium-high heat until brought to a simmer. Turn to medium-low. Simmer for 3 to 4 hours, or until the broth reaches desired richness. Combine all the ingredients in a slow cooker and add 6 to 8 cups water to cover all the ingredients. Cook on low for 6 to 10 hours, or on high for 3 to 4 hours. Combine all the ingredients in a pressure cooker and add 6 to 8 cups water to cover all the ingredients. Cook at high pressure for 30 minutes. If using an Instant Pot, choose manual, and set timer to 30 minutes. 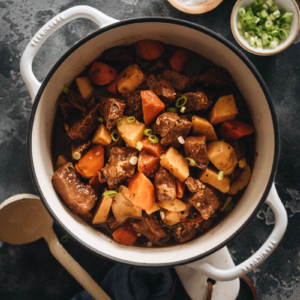 If using a stovetop pressure cooker, cook over medium-high heat until high pressure is reached. Turn to medium low heat. Continue to cook 30 minutes. Filter the soup with a fine mesh to remove the solids. From the herb mix, all the herbs except codonopsis root are edible. You can either serve them with the soup or discard them with the rest of the herbs. You can serve and drink the broth directly, or you can make it into a noodle soup following this post. Thank you so much for this recipe. Yet-hay is a big problem right now. I am helping my aged mother who keeps the house sooo hot–and dry. My question is: do you use nan xing or bei xing? I usually use both. Thanks! Hi Cheena, sorry for the late reply. I’ve got the answer from our herb expert Cindy. Her answer is: Nan xing tastes better but is less effective than bei xing. In the yeet hay mix, we use only bitter because the mix is already sweet enough and doesn’t need more. You can use a mix, can use just bitter for maximum effect, but never too great to just use sweet.